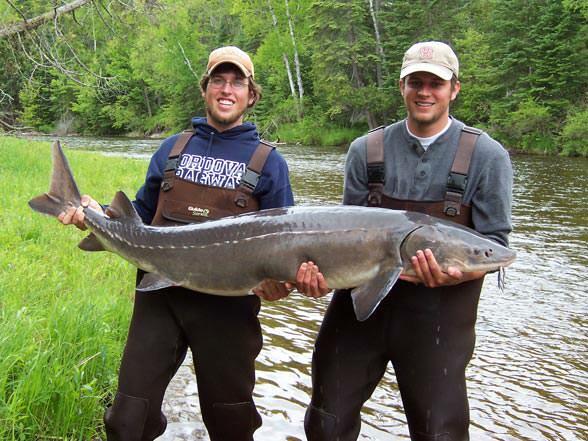 The sturgeon spawning season on the Upper Black River began the end of April and concluded in early June, and those involved with protecting the fish and collecting data have declared the season highly successful. "Two-hundred (200) sturgeon were netted, tagged and cataloged," said Dr. Kim Scribner, lead sturgeon researcher with MSU. "Additionally, our research team collected eggs and milt from numerous sturgeon to raise in our newly developed streamside hatchery." Naturally produced larval lake sturgeon were also collected and transferred to the rearing facility for rearing. Of the 200 sturgeon netted and released during this spring's spawning season, 46 were sturgeon never before captured, while the remainder were recaptures from previous spawning season efforts. This information indicates that new generations of sturgeon are reaching maturity in Black Lake, a sign that the population is slowly recovering. "The sturgeon effort in Black Lake and on the Black River is one that we all take great pride in," said Dave Borgeson, Northern Lake Huron Management Unit Supervisor for the DNR in Gaylord. "This program is a role model for other programs nationwide in that it involves all aspects of resource management that are necessary for recovery of lake sturgeon in Black Lake."